I consider myself to be a “Missionary To America.” America is NO LONGER a “Christian Nation,” if it ever was. I am out on the streets very often, preaching the Gospel in the darkest of places in the hope of reaching the lost. I KNOW that God’s Word will NEVER return void! 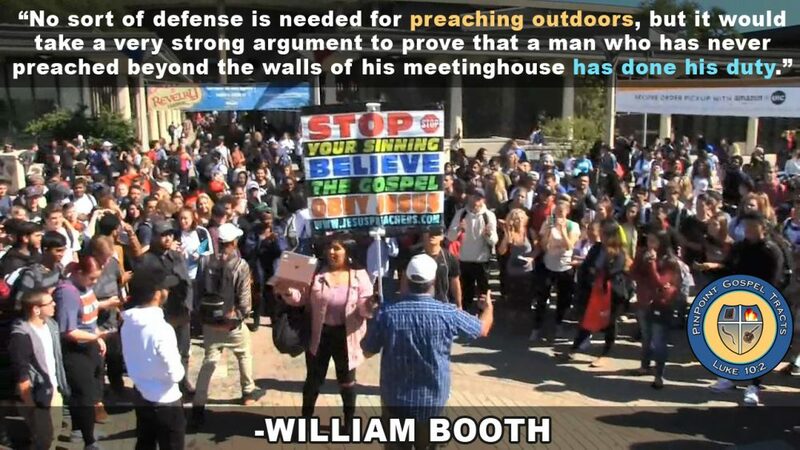 I go to college campuses, public parks, music concerts, bar/club districts, beaches, sporting events, parades, festivals, flea markets and any other public place where there are breathing people who need to hear the Gospel that saves. God has also led me to go to other countries, as well. I’ve been to Canada, the Philippines and Ireland. As God leads, I will go into other nations, as well. In the upcoming months and years, I believe that the Lord may be leading me to also go to Australia and Israel. I also believe that the Lord will lead me to continue going back to Ireland. Pray with me and for me, that God’s will be done. -That I would preach with boldness, power, conviction and compassion, as I ought to. -For physical strength and health – especially for a strong and enduring voice, so that as many as possible can hear the Gospel. -That I would speak with wisdom, in making the message clear and that I would make the wisdom of this world look foolish. -That the hearers would be interested in the Gospel message and that large crowds would gather around to hear the preaching of the truth. -Good weather and safe travel – no rain or wind, that the sun and the Son would shine on us. -Plowing the soil of the sinners’ hearts, sowing the seed of the Gospel into prepared hearts and reaping the harvest. -That the Saints of God would be encouraged, instructed, emboldened and motivated, in taking part in the Great Commission. -Unity and support from other Christians on the streets and on college campuses. -That every financial need will be met. -That the strongholds of the devil will be torn down. -Favor with the police, security and any other type of authorities that we run into. -That I would live a life of holiness, be a student of God’s Word and be a man of prayer. -That my priorities would be straight, in being a husband and a father. I really appreciate your interest in wanting to support me financially. It is because of Christians like you that I can continue doing what I am doing! If God is leading you to support this ministry, you can make a donation online through PayPal or you can send a donation through the mail. You can make a one-time donation of any amount by clicking on the donate button with the credit card symbols below. You can make a donation through the mail, by making your check/money order out to “PinPoint Evangelism” and sending it to the mailing address, below. Praise the Lord! Thank you so much for your prayers!